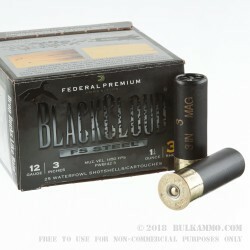 Federal contends that their Black Cloud FS Steel line of shotshells takes nontoxic steel loads to their next level of performance. Every Black Cloud shell is equipped with a proprietary FliteControl wad that delivers improved pattern density and consistency through both ported and standard waterfowl chokes via its redesigned rear-deploying petals and side-mounted vents. This shell’s lead-free Catalyst primer and clean burning propellant serve together to reduce the amount of residue accumulation in the barrel and action significantly. 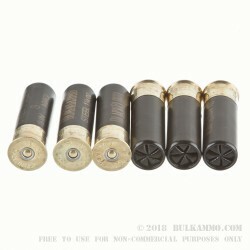 Furthermore, this shell’s black nickel head prevents corrosion, and its sealed crimp prevents moisture infiltration even in the dampest conditions. 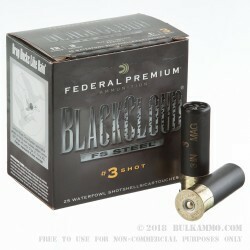 Even with all of that, it’s its shot that really makes a Black Cloud shotshell stand out of the crowd. 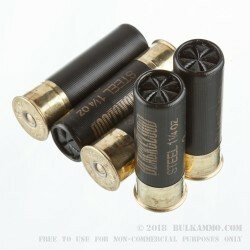 This shell’s #3 steel shot is composed of 40% uniquely shaped FliteStopper pellets and 60% regular steel shot to provide a one-two punch that’s certain to knock even the burliest ducks out of the air. This shell represents an impressive array of features which any duck hunter should be certain to benefit from during their next wetlands excursion.